This chapter starts to talk about how to manage partitions with partition manager PartitionGuru. No software can match PartitionGuru as it provides so many partition management functions and at the same time it offers professional data recovery feature. In this article, all operations on hard drive and partition are completed by PartitionGuru. Good News: PartitionGuru Free, the free version of PartitionGuru, has included almost all functions you may perform to hard drive or partition. As in the picture above, there are two hard drives on my virtual machine, and one hard drive has only one partition and large free space. If you want to create new partition from free space, you can right click the area and select item "Create New Partition". On account that the partition table of the hard drive is MBR, so have we need to set the partition as primary partition or extended partition. Besides, we need to select file system format for the new partition and we usually choose NTFS for partitions on internal hard drive. 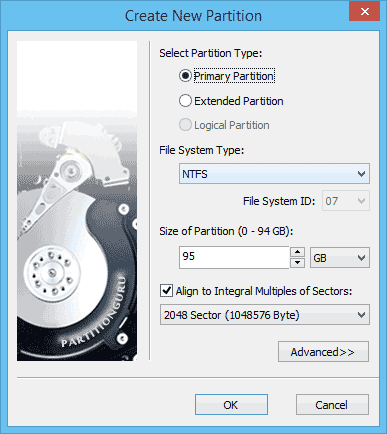 Next, partition size can be modified to any size, but usually new partition includes all free space by default. If the hard drive is GPT then there is no need to set primary partition or extended partition. If the partition is created on extended partition, then you have only one option, i.e. logical partition. The last option relates to the concept "4K sector alignment", and you can check the box before the option and set the value as 8 sector or any item larger than 8 sector, after which the partition will be aligned to 4K sectors. If you are computer expert, then you can click the button "Advanced" to set more detailed parameters for the partition. 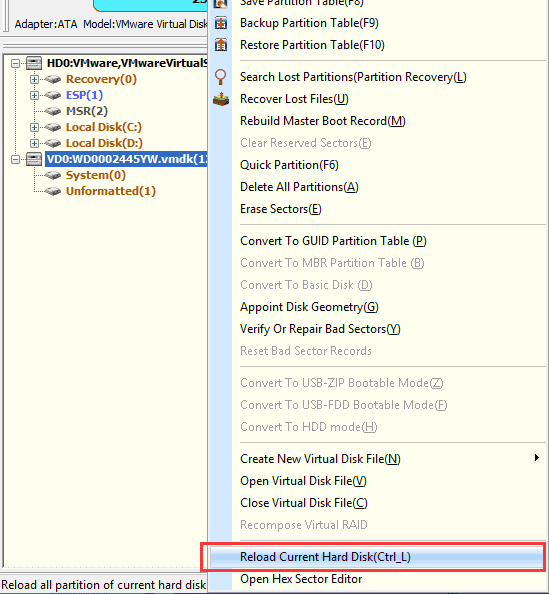 If you change mind and don't want to create the partition for the moment, then you can discard the previous operations by reloading current hard drive: right click the model number that represents the hard drive and select the item "Reload Current Hard Disk". These are all the steps of creating new partition, and next chapter continues to explain how to manage partition with PartitionGuru.